In this technical world, even your wallet is going to be digital. Yes, you heard it right. Search engine giant Google is going to digitize your wallet too. Transferring money through your mobile phones is not a new concept to anyone of us. As we have seen a venture of Airtel in the form of Airtel Money, which facilitates you to transfer money to other persons through your mobile phones only. But this service could not gain much exposure due to its typical interface and high processing fee. But the technique that Google is developing is a new concept that is going to replace your wallets, so you can perform all your transactions through your mobile phones, for everything you buy, whether in the market or through online shopping. This technique is still is in its development phase. But what makes it more interesting is the involvement of various technical giants like Google, Visa, Paypal and others in the development of a common system for this application. This makes it more effective, yet interesting. Primarily, this application will be using another application or another utility of your smartphone called, Near Field Communication (NFC). This is going to facilitate you to make payments through your smartphones while actually making it through your account, debit card or credit card. This means in future you have to just TAP your smartphones in order to make payments either at retail shops or online shopping portals. This application is currently available in the United States Of America (USA), as it requires various permissions, grants and clearances from the Government to make it actually happen. Thus, expecting this facility to arrive in Asian Markets especially India, in the coming years, is a day dreaming. With Google Wallet, you can easily send money to other users, receive money from another user, make payments at retail shops or can even pay while you are shopping online. For sending money to another user, Google doesn't charge you if payment is made through Google Wallet or your bank account. But if the money transfer is done through your debit or credit card, Google is going to charge 2.9% of the total payment amount, or at least $0.30 per transaction. 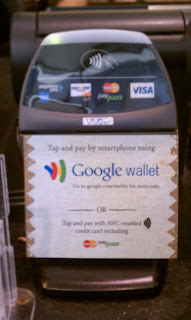 For receiving money into your Google Wallet, you do not need to pay any transaction fees to Google. But if you add money to your Google Wallet using your credit card or debit card, then you must be ready to pay 2.9% of your transaction amount to Google. Google has also signed up a pact with some of the famous retail brands to provide its customers with some "loyalty points" if payments at their outlets are made through Google Wallet. These loyalty points can be redeemed in near future for all further purchases that you make using the Google Wallet app. In all this process, you have the loyalty and confidence of industry giants like Google, which prevents your account from any spam attacks, and makes your shopping and payment experience more smoother and safer. This is a guest post by Arsh Kapoor, who is a computer science graduate. He is a passionate blogger, and has developed his career in blogging. Go to some of his posts like Android development tutorial on his blog weltoshop.info.